Velbekomme is a Scandinavian cafe in ultra trendy Chorlton with a small menu including omni, veggie and vegan options. 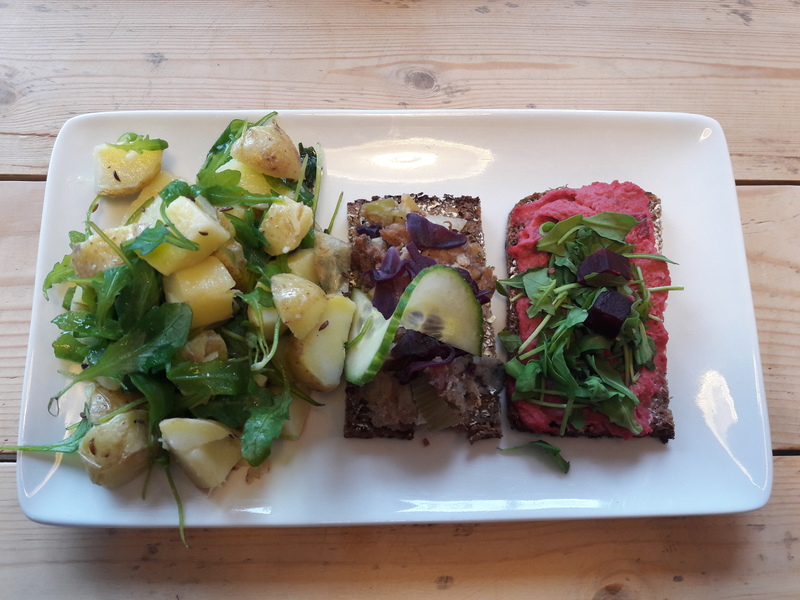 The small cafe is decorated with various Scandinavian flags and has cookbooks from Norway, but I’m classifying it here as Danish because I went for the smørrebrød option. For anyone not quite Chorlton enough to be in the know, smørrebrød is a slice of rye bread, buttered (or margarined, in this case) and topped with some kind of cold topping. 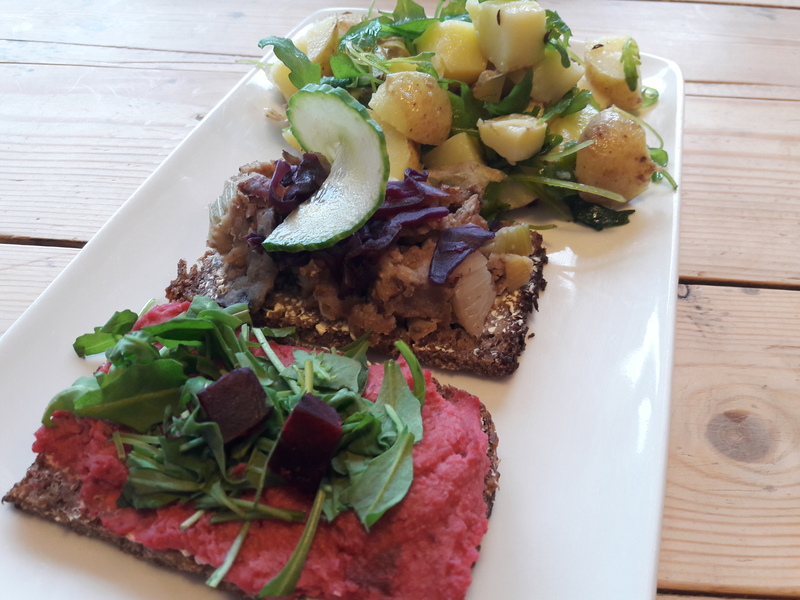 Velbekomme offers this vegan smørrebrød plate for £5.50, combining these open sandwiches and a salad, if you so desire. I got one each of the vegan options when I visited. I’m a sucker for beetroot hummus because it’s just such a pretty colour. Also, it’s delicious! The other topping was celery, red cabbage and mushroom, and was really tasty. In both cases I kind of wished the bread had been toasted for a nice bit of crispness, but apparently that is not the Danish way. The potato salad was seasoned with caraway seeds and was also really good. Is there much Danish cuisine in your neck of the woods? This entry was posted in Travel, Vegan Mofo and tagged vegan Manchester, vegan travel, veganmofo18, Velbekomme Manchester vegan. Bookmark the permalink. I never knew the term “smørrebrød” was used like ever. lol It always been a funny word you hear from time to time and only till recently I’ve heard it used in the regular. I think the closest I’ve gotten to Danish food is a danish pastry, and I hate them. I don’t even know how it’s possible to hate Danish pastries! I have a feeling they are like bad apples, if they are fresh and the best, I don’t want to touch them. I am still open in trying a few vegan ones, if they have a reputation of being the best.